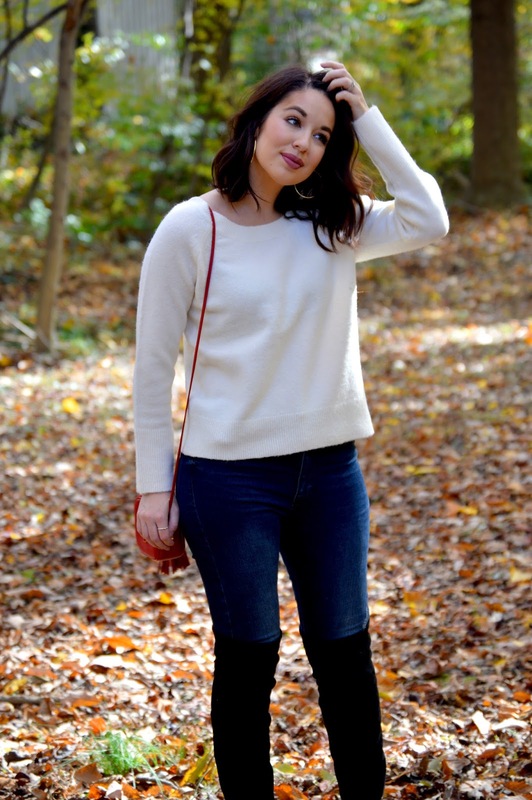 Rosy Outlook: Velvet Bow + Fashion Frenzy Link-Up! Velvet Bow + Fashion Frenzy Link-Up! Happy Wednesday loves! If y'all follow me on Instagram you might have seen that I ended up having to leave work early because of a sinus infection. I've just been trying to recover from that since! I stayed home yesterday which definitely helped but it is such a weird feeling. I have chronic sinusitis so unfortunately this happens almost every year and I get really bad vertigo from it which is scary! I am feeling a little bit better today though. This sweater I absolutely ADORE! I shared it on my IG stores because I think it is so precious with the velvet bow detail in the back. I also just love the super soft, fuzzy material. I think this whole look would actually be perfect for a Christmas get together with the family or maybe if y'all are like us, we always do something fun for Christmas eve so I think I'll definitely be breaking this sweater back out for it! What a fabulous sweater! the bow detail in the back is so cute and I love the pop of red in that bag. omg that bow detail is AMAZING!!! So pretty!! I love this top, the velvet bow detail is just perfect! I hope you are feeling better soon, sinus infections are the worst. Glad to hear you are feeling better and that detail on the sweater with the velvet bow is so chic. Love it. Love your simple yet chic outfit! That outfit is so cute! I love those boots. Love this cozy chic look !! The velvet bow is so pretty ! I adore that red purse and the OTK boots are just gorgeous! Hope you start feeling better girlfriend! Thanks for the feature :) Made my day! That sweater is too cute and love the bow detail! Happy Wednesday love! I'm now convinced that you just have the best closet for cute, casual wear. All of your sweaters are perfection!! You cannot go wrong with a pair of boots! You look amazing!! I just love the bow on the back, it's going to be so pretty for the holidays. Sorry you've been feeling bad, hope you feel better soon! I LOVE unexpected details like these! That bow is so dainty and girly! Perfect find! You're too cute, lady- love that bow detail! And swooning over that red YSL! So cute! Love that sweater! Love the outfit ,especially the boots! Oh no! I'm so sorry to hear you have sinus infection. I'm hope you're feeling even better now. As for this outfit, it's super cute! I love that sweater, it looks super cozy and I adore the little bow, so cute! You have the best sweater collection hands down, girl, lol. I also love the pop of red with that gorgeous YSL bag! Thanks for sharing and again, I hope you're feeling better! The simplicity of this outfit is actually what makes it look really fab. Lovely detail at the back of the sweater dear, and of course, you can never go wrong with over-the-knee boots. I love the bow detail on the back of the sweater and your gorgeous red bag! Hope you feel better soon!